Tomorrow’s Ribblesdale Cricket League fixture at Whalley Road could be a battle between the bowlers. 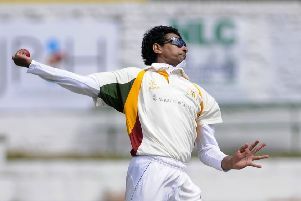 Ribblesdale Wanderers professional Primosh Perera is the division’s third highest wicket-taker so far this season with 37 while Read’s overseas amateur Bailey Richards is just four behind. Veteran Ian Britcliffe and home professional Matt Walker are also locked on 28 wickets apiece while visiting skipper Jordan Britcliffe has 27. Sri Lankan Perera has also impressed with the bat, posting 524 runs so far, the fourth best return, with Read’s William Wrathall ranked as the fifth best amateur with 438. Elsewhere, Padiham welcome Earby to the Arbories. Toby Burrows is statistically the third best amateur bowler in the league having taken 28 wickets with professional Siviwe Gidana adding 25. Former skipper Callum Clarke (pictured) is currently the best amateur batsman in the division with 534 runs.